Hello. I am new here and am posting for some help with my dog Romeo who is a 13 year old Cocker Spaniel we adopted 3 years ago. When we got him he had bad dental disease, occasional shaking in his hind legs, his right eye doesn't blink and I don't think he can see well out of it, among some other issues. I have been giving him Honest Kitchen grain free chicken for years and occasionally would give him some raw meat. I also would give him fresh vegetables daily and wild blueberries every evening along with some barley grass juice powder and occasionally a small amount of ester c and liquid b12. Over the past few weeks he became very tired sleeping a lot. He was sneezing, coughing , drooling and drainage would flow out his nose. He would not want to go for walks but once you would get going he would love it and run like he used to. the past 5 days or so he has not been eating well if at all, panting and drinking a lot, restless, breathing rapidly, sleeping a lot and having a hard time getting up stairs because his hind legs are weak. He also has a large lymph node in his neck. I took him to the vet yesterday and it was a short terrible visit. They took his temperature , felt around his body, looked at his teeth and told me basically he is dying and I could put him to sleep today or we could give him some antibiotics to see if it extends his life a little bit. He said he was swallowing a lot of bacteria and it probably went to his heart (he heard a slight heart murmur) and kidneys. He said his dental disease has taken over and we need to prepare for end of life. I had given him a little bit of sovereign silver to see if that would help last night, apparently that wasn't a good idea as I feel it made him worse today. Any advice would be extremely helpful as I feel he is going to leave us at any time. All he wants to do is go outside and lay on the cold ground. Thank you so much. Did your vet do any recent or past testing (blood, urine, x-rays, etc.)? If so, can you upload it here? The vet did no testing whatsoever. basically sent me on my way. I ended up having to take Romeo to an emergency appointment somewhere else today for a second opinion as my husband requested. They did all blood work and full exam and said the only thing that came back was a slight elevation in white blood cell count. They said he should be ok with a dental and said he should have all teeth removed. They are very very bad and his breath is horrible along with drooling. Liver and kidney tests were OK. They gave some drops for his left ear because they said it was positive for yeast. The plan is to have the teeth removal on Monday. He was given clindamyacin two times a day. I am worried this will totally ruin his gut health but I cannot watch him be so miserable and take a risk. I plan on hopefully getting through this all and get to work on helping him stay healthy. Can homeopathy be given prior to this dental surgery and with antibiotics? Can probiotics help now in this situation? Thank you so so much Dr. Jeff I am so grateful. I thought he was taking his last breaths today as he wouldn't wake up easily and would not stand up. They also talked about a rabies vaccine during anasthesia because he is behind and I declined. He has not had any vaccines since we got him July 1st of 2016. Is the rabies vaccine safe for his age? I believe he is fully vaccinated but I do not know his medical history since he came from the Humane Society. He is also chipped which I do not like. Thank you for your help and anything else you could advise. Great news about the blood tests. The elevated white blood cells just show that Romeo's immune system is doing its job against the bacteria on the bad teeth. He should be much, much better (probably back to normal), and out of pain, after his dentistry. Then you can concentrate on treating any internal imbalance that remains. Please keep us updated here. Thank so so much.. you are such a blessing. I would add probiotics while on the antibiotics. I know that one of our speakers said to use it only after the antibiotics, and I am open to learning more about that. For now, I have seen great benefit using it during as well as after. My husband just dropped Romeo off for his surgery. He called me and told me that they said they HAD to give Romeo a rabies vaccine while he was under Anastasia in order to legally board him. When the vet asked me about giving him that on Friday I said I would prefer not to until he was well. To me this is unethical. Im a nurse and if a child is ill at a visit vaccines are not given until the child is well. I would think this would apply to animals as well,, no? Do no harm? I'm sorry to hear about the added rabies vaccine. It is SOP in most vet facilities because of state law! Yes, one would think that "First Do Harm" should be the priority but public health policy dictates otherwise. However, at this point it's more important for him to have his procedure. We'll help you deal with any problems that may develop afterward. In context, this is a small bump in the road to his wellness considering that the first vet wanted to euthanize Romeo! you are right Dr Jeff. Thank you for the reassurance, I hope I did the right thing. Yes that first vet was Rotten and left us hopeless. Romeo has 6 teeth left. when we picked him up he was panting, he acted like he did not recognize us and was restless. They had given him fluids all through the day through IV. They sent him home continuing clindamyacin, starting on 4 gabapentin a day, and a pain reliever one time a day. Since he has been home he wants to eat but not drink. He has been panting most of the time. His back legs give out on him and at times he collapses. We have wood floors so I know sometimes his legs will slip but not like this. He is having shaking in his back legs, almost like tremors, and is having twitches where his whole body will randomly twitch and sometimes so much it will make him fall a little. He wants to stay in one place and stares at the wall. He also is pawing at his head and face with his feet and sometimes will do it repetitively. He did the rabies vaccine. also when he does put his head down there are medium sized pools of pink blood and saliva. he is just not the same. I know it will take time for him to come out of this but the ticks and twitches worry me. Is this normal for a dog to be this way after a dental surgery? THank you so much. update on Romeo. He is collapsing. His legs give out and its not from the floor because he has done it outside as well. He gets off balance and has fallen over and his gait is ok at times otherwise it is not normal. He is twitching throughout his body and his whole body will jerk randomly. He will not come to me but will follow me around like he always has. I'm the only person he does this with, he won't follow anybody else in the family, never has. His back legs shake like tremors, which he did have a little bit for the years we have had him but not like this. He still wants to eat non stop like he always has and is drinking now. He does not act like he's in pain, but I never know because he is a dog that never barks or makes noise. Since we have had him he only has barked about 10 times and growled at our cat once when she came near his food. He has not slept all night that I know of and pants non stop. He acts fearful to go out into the yard, although I think that is getting a little better as he has gone out to go potty, but he will not lay in his bed in our room and will not go in our room at all, acting scared of that as well. He did lose balance when he was going number 2 and sat in it. I am feeling like this is a neurological problem from the vaccine, as I do have 2 boys that were affected by vaccines that I am also working on healing one, along with myself. I gave him gabapentin last night and it didn't seem to do much, maybe calm him down some from the panting. He is supposed to have Rimadyl this morning and after reading what I have read about that drug it scares me to give him that. he has eaten a full meal this morning and right now he is laying on his side trying to sleep and is breathing fast and his legs are in a constant tremor. I listened to a lot of the webinar last night, which I had to call in because I could not get sound but just can't seem to put this all together. I have not had the time to go through all of the information here as I have been trying to help him. How is Romeo today Jenni? Also, you mentioned a pain killer and I wonder which one. All of the responses you mention are common after the triple whammy of anethesia, dental surgery and vaccination. I'd expect him to be internally re-balanced in 3 days (if not before). In the meantime, support his vitality by getting him out in the sunshine and fresh air as much as possible. An awe-some food-based support is the Myos powder + Manuka honey mix.I'll post the recipe this afternoon. Go easy on the Rimadyl, but judiciously use Arnica as we discussed last night. 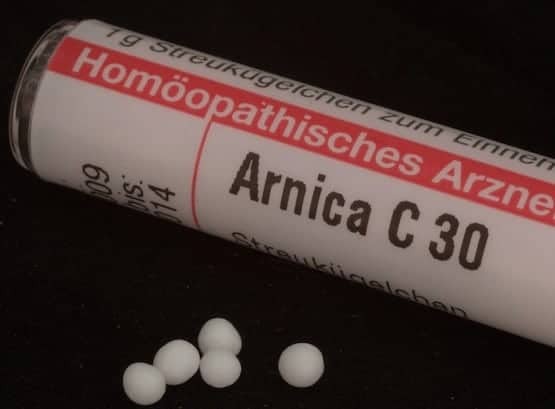 Dose the Arnica in water (the highest potency you have) and succuss the cup prior to dosing every few hours or whenever he gets restless, anxious, uncomfortable, etc. I will go over to the natural grocers we have nearby and get some arnica. I do not know what all these terms mean like I said I have not had time to read or watch much as Im pretty strung out with this . I will go over when I can I don't want to leave him by himself. I will also check into Myos powder if that is something that I can buy, and I do have a raw organic honey but the Manuka honey is very very expensive here. would the raw organic work? or I can check amazon for Manuka. It seems the gabapentin makes the wobbliness and lack of coordination worse. since I gave him another dose this late morning it escalated again. still tremors shaking and body jerks.thank you so much for your help. trying hard to stay as calm as I can because I know he picks up on it. all I could get is a 6c pellet. near impossible to get liquid into his mouth. I could put the 6c in a bit of soft foo if that is ok.? Yes, it's fine to put the pellet in his mouth. For the frequent repetitions that may be needed if he is restless, seemingly uncomfortable, etc. you can make up a solution by adding 1 pellet to 1 cup of water. Succuss the cup 10x and let him sniff the cup (this is an olfaction/sniff dose) as often as he needs. Thank you Dr Jeff so much. This is helpful. I did give him a half a pellet this morning and within 5 minutes. all of a sudden he tilted his head to the left and looked around, stood up and started walking towards the door. it was very strange. after that he was going in and out the door, would lay down, get back up, etc. I thought for sure I did something wrong. after about an hour and half he has come in and laid down to sleep.i have not given him gabapentin since yesterday, it makes him so much worse with his balance, twitches and tics. I will try again in a while and then try the sniff dose.